Zsuzsanna Szebeni, who is the curator of the Count Bánffy exhibition at the Budapest Opera House, contacted me to say that the exhibition has re-opened at the opera house from 3 April 2012. If my Magyar is up to scratch it appears to run until 24 June, but I could be wrong about that! From the 16th of July the exhibition will move to a larger location in the city of Sepsizsentgyörgy or Sfântu Gheorghe (in Romanian), a city which is predominantly Székely Hungarian, and lies to the north-east of Brasov in Transylvania. 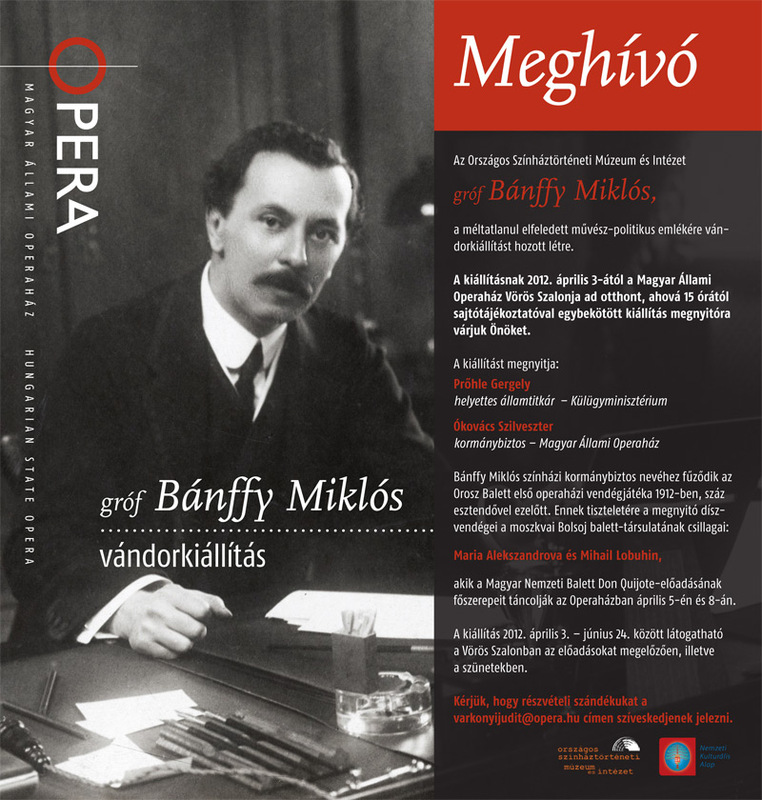 Miklos Bánffy was a Transylvanian Count and director of the Budapest Opera House at the end of the Great War. At the same time he planned the very last coronation of a King of Hungary, the last Emperor of the Austro-Hungarian Empire, Charles I. This is all wonderfully described in the English Translation of Bánffy’s memoirs, The Phoenix Land, published by Arcadia Books. As you will know by now, Paddy wrote the introduction to the English translation of Bánffy’s fictional Transylvanian Trilogy which is wonderful and an absolute must read. Cluj gets many a mention. You can read more about Count Bánffy here on the blog. You can contact Zsuzsanna as follows: Mobil: +36 20 3304070 and Office: +36 1 3751184/128. For those of you who speak Magyar you will find this video of interest. For those who don’t I hope that you will enjoy the colourful images! This entry was posted in Other Writing, Romania and tagged Budapest, Miklos Banffy on April 17, 2012 by proverbs6to10. I thought this would be of general interest. I don’t recall Paddy encountering any Greeks in Hungary but he did come across Greek fishermen from the Greek diaspora when walking along the Bulgarian Black Sea coast in late 1934. That encounter was related in Words of Mercury and includes the Mystery of the Black Sea Cave. First published in The Hellenic Voice, 22 June 2011. The Greek presence in Hungary is one of the oldest in Greece’s modern diaspora. It is, further, one of the most interesting, because as a tragic accident of war and politics, it received a new lease on life, a second chapter of sorts. The Greeks’ odyssey in Hungary is a tale of two diasporas and the efforts of current Greeks to unite the two acts into a common play. After swallowing up the Balkans, the Turks shattered the Hungarian army at the Battle of Mohacs, and the Turks controlled most of Hungary, and up to the gates of Vienna in Austria, for more than 150 years. On the heels of the Turks’ second, failed siege of Vienna in 1683, the Austrians, at the head of a multinational European force, began the taskof evicting the Turks from Central Europe. When the guns fell silent, in 1717, the Austrians and Hungarians needed to rebuild their realm devastated by war, and many Ottoman Christians, primarilySerbs but also Greeks and Vlachs, responded eagerly. Greek merchants quickly established themselves in major Hungarian cities, such as Buda, Pest, Szentendre, Miskolc and Tokaj. They were heavilyinvolved in the overland trade with the Ottoman Empire, but they also worked as agriculturalists and vintners. There is some evidence that winemakers from Macedonia first cultivated Hungary’s prized Tokaj wine. The Greek merchants were heavily involved in the coffee trade, and some of the oldest Budapest coffeehouses have Greek origins. As an avid coffee drinker, this makes me particularly proud. The Greeks’ natural appetite for commerce, their large commercial network in the Ottoman Empire and their growing colonies throughout the Austrian (later Austro-Hungarian Empire) brought a great deal of wealth to the small but financially and politically powerful community. The Greek community supported schools, charitable institutions and of course church organizations. Initially the Greek students studied at the Serbian school, but by 1785 they established their own, which operated continuously until 1900. The Greeks and Vlachs established a church community separate from other Orthodox nationalities (though still subject to the Serbian Patriarchate), and their cathedral, built in 1809, continues (as the Hungarian Orthodox Church) to serve a largely Hungarian Orthodox community, often Balkan in origin. Other Greek Orthodox churches grace several Hungarian cities, including Tokaj, Eger and Miskolc. The Greeks’ very success fostered an increasing assimilation. Greeks left the merchant class, became naturalized Hungarians, and in some cases nobility. Events in Hungary followed a similar pattern to those in Vienna and other key Austrian commercial centers. Lacking the critical mass of population that the Serbs had in southern Hungary (which later became the Serbian province of Vojvodina, where my family and I currently live), the Greeks became Hungarians, though some did keep the Orthodox religion of their ancestors, and vestiges of their culture. Just as the First Greek Hungarian diaspora faded into assimilation and history, events in Greece stirred up another wave of Greeks into Hungary. Many of these immigrants came from the same mountains as the first diaspora, but they were not merchants, but refugees – guerillas, villagers and intellectuals of the communist movement in the Greek Civil War. Many were children, many came involuntarily. Their connections with Greece were severed by the hard frontiers of the Cold War, but they did not forget Greece or their traditions. In the “Greek” village of Beloiannisz (Beloyiannis), which I visited, or in small communities in Budapest, Miskolc, Pecs and Kesckemet, the Greeks kept their language and culture alive. In the communist period the Church played little role as a guardian of faith and identity, in contrast with the first Greek diaspora in Hungary, or Greek diasporas in the Americas or Australia. In the post-communist era, the role of the Church has reemerged. Other virtues we associate with the diaspora, hard work and study, also marked this post Civil War diaspora. Greeks excelled in academia and professions well out of proportion to the small size of their community. All of the Greeks I met, including the second generation born in Hungary, spoke Greek with a precise fluency. A fair percentage of the Greek Hungarian community repatriated to Greece, particularly in the 1980s, but the community by that time was quite well established in Hungary. The Hungarian government recognized Greeks as a distinct minority and cofunded cultural and educational activities. This support enables a diverse educational and cultural agenda, including an elementary school, weekly cultural performances and a growing literature about the community. When I arrived at the cultural center, I was welcomed as a fellow diaspora Greek, and loaded down with books on the community. I spent an hour talking to Professor Nikosz Fokasz (Nikos Fokas), an eminent Hungarian sociologist and one of the Greek community’s leading intellectuals. Son of a Paris-educated Cephalonian architect and a mother from a village in Evritania, Professor Fokas is an urbane academic at home in university circles throughout Europe and North America. He considers thispostwar Diaspora to be the keepers and the descendents of the first diaspora. After all, both generally descended from the same Macedonian and Epirote mountains, a “diaspora of the Mountains,” as he calls it. Many Hungarians are now rediscovering their Greek roots, with the active help of this newer Greek diaspora. Professor Fokas noted, with a particular pride, that Baron Simon Sina, a Greek Hungarian, financed Budapest’s most iconic Danube bridge, Lanc Hid (Chain Bridge), as well as a large part of the Hungarian Academy of Sciences, another signature Budapest building. Honoring him, Greek Hungarians have been instrumental in establishing the “Sina Award,” bestowed upon a member of the Hungarian business community for outstanding support of the arts and sciences. Fostering awareness of Hungary’s Greek and Orthodox elements in its history has been a key contribution of this new diaspora, and in so doing, it has honored, and in some cases, literally resurrected, the first diaspora. As always when I travel among diaspora Greeks, I felt a common bond with the Greek Hungarians in spite of our very different histories. There was that love of Greece, somehow less jaded, than that of Greeks in Greece. There is also a very clear consciousness among Greeks in Hungary that the history of Hellenism and Orthodoxy is a long one in their country, and that custody of this tradition is an important role, which they assume with pride. It is a pertinent lesson for our community in America. Alexander Billinis is a Greek American writer living in Serbia. He previously worked in international banking in the US, Britain and Greece. His book, “The Eagle has Two Faces: Journeys through Byzantine Europe,” will be released later this year. This entry was posted in Uncategorized, Words Of Mercury and tagged Artemis Cooper, Black Sea, Budapest, Bulgaria, Greek diaspora, Hungary, Patrick Leigh Fermor on August 10, 2011 by proverbs6to10. The article is written by New York Times’ Frugal Traveler columnist Matt Gross who attempted to follow in the footsteps of Patrick Leigh Fermor. Like all good stories it begins …. ONCE upon a time, a young man went for a walk. It was December 1933, and an 18-year-old Englishman named Patrick Leigh Fermor put on a pair of hobnail boots and a secondhand greatcoat, gathered up his rucksack and left London on a ship bound for Rotterdam, where he planned to travel 1,400 miles to Istanbul [Ed: Constantinople!] — on foot. He had virtually no money; at best, he’d arrive in, say, Munich to find his mother had sent him £5. But what he did have was an outgoing nature, a sense of adventure, an affinity for languages and a broad network of friends of friends. Something to write about indeed! The books he produced from the yearlong journey — “A Time of Gifts” and “Between the Woods and the Water” — are gorgeously rendered classics that have led many to call Mr. Leigh Fermor, now 95, Britain’s greatest living travel writer. But to my mind, he’s always had another title: the original Frugal Traveler — the embodiment of that idea that, though a wanderer may be penniless, he doesn’t have to suffer. And Mr. Leigh Fermor never suffered, thanks to the miracle of human generosity. Peasants gave him baskets of eggs and swigs of raspberry schnapps. Small-town mayors found him beds. The lingering nobility of Europe put him up in their castles, invited him to balls and lent him their horses. When Mr. Leigh Fermor did sleep rough — in hayricks and barns or on the banks of his beloved Danube — he did it by choice, not because (or not merely because) poverty required it. He knew, even at 18, that the world is an experience to be savored in all its multifarious incarnations. Could a young person (is 35 still young?) with strong legs and little money find the same spirit of hospitality that Mr. Leigh Fermor encountered some 76 years ago? At the end of March, I set out to find the answer. With only two weeks free, my plan was to walk from Vienna to Budapest, a 180-mile route that would connect the old poles of the Austro-Hungarian Empire and track Mr. Leigh Fermor’s trail as closely as possible, taking me along the Danube to Bratislava, the Slovakian capital, and across the plains of Slovakia south to Hungary — through three countries whose languages, cultures and histories could not be more different, or more intertwined. It was tempting, the day I arrived in Vienna, to just walk east from the airport, but I couldn’t completely skip the Austrian capital, where Mr. Leigh Fermor had spent three weeks among the “crooked lanes” and “facades of broken pediment and tiered shutter.” And so I followed his lead, going into the imperial crypt, where the grandest members of the Hapsburg family lay entombed in elaborate sarcophagi, and into the museums, although I shied away from the most famous in favor of oddities like the International Esperanto Museum. And I luxuriated in storied places like Cafe Alt Wien and Cafe Bendl. But after two nights in Vienna, I was restless. So I crossed the Danube, put on my 45-pound pack and took off down the Donauradweg, a well-kept biking trail that runs from the river’s source to its mouth at the Black Sea. To my right, the Danube, more green than blue, sparkled in the cool sunlight, and I encountered fishermen tending their rods, elderly sunbathers, nordic hikers poling along and cyclists speeding in both directions. This first day, I figured, I’d take it easy and do only 15 miles. Ideally, I’d need to hit 18 miles a day — about six hours of walking — to reach my goal. It seemed reasonable, especially with the terrain so uniformly flat. The path, sometimes dirt, sometimes paved, would often stretch so far and straight that I couldn’t imagine I’d ever reach the end, and then I’d finally hit a slight turn and face the same thing: an art-school lesson in perspective, complete with the first low foothills of the Carpathians at the vanishing point — and a scampering rabbit to remind me this was no still life. Even with such straightforward terrain, there were snags. An attempted shortcut through a fuel depot left me with minor scratches and an extra three miles. But such mistakes have a way of turning out for the best. Had I stayed on the trail, I would have never crossed paths, two hours later, at the edge of Donau-Auen National Park, with Jean-Marc and Marie, newlywed French cyclists who stopped to say hello when they saw a lone hiker in the middle of nowhere. They were taking an extended honeymoon: a two-year bicycle journey from their home in Paris — to Japan! “Do you know where you’re staying tonight?” I asked. They didn’t. I told them to meet me at Orth an der Donau, a small Austrian town a couple of miles farther down the Danube, where I had arranged for a place to stay via CouchSurfing.org. Maybe, I said, my host could find them somewhere to pitch their tent. THE host, Roland Hauser, whom we met in front of Orth’s impressive castle, did better than that. He invited them home to his dreamland of soft beds and hot showers. Roland, 26, had traveled from California to Southeast Asia to New Zealand, and his German-accented English was peppered with words like “sí” and “bueno.” That evening, we cooked spaghetti Bolognese, nibbled Südtirolean ham and drank big bottles of beer. I went to sleep marveling at our extraordinary, Fermorian luck. In the morning, after coffee, I threw out my underwear. This was a strategy to lighten my load — bring old undies and get rid of them day by day. Frankly, I should have done that with everything, as the pack was needlessly heavy. Along with two weeks’ worth of shirts, I had an ultralight down jacket, a waterproof shell and rain pants. A tent and sleeping bag. One pair of jeans and lightweight canvas shoes to change into at day’s end; nothing worse than walking 20 miles and spending the evening in the same clothes. And I packed Mr. Leigh Fermor’s books and Claudio Magris’s “Danube,” which I never had time to read. And my computer and camera gear — work necessities, alas. When I set off, I was wearing my typical walking outfit: khaki pants by a company in Portland, Ore., called Nau; waterproof running sneakers by Lafuma; good socks (as important as good shoes); and a long-sleeved cotton shirt. The walk began well. My feet were tender, but the flatness of the Marchfelddamm, a high berm that doubled as biking path and flood deterrent, ensured that I wasn’t struggling. This was the heart of the Donau-Auen National Park: forests of thin trees broken by occasional streams flowing to the Danube. At first, I appreciated the play of light on the water and between the trunks, but hour after plodding hour of unchanging scenery soon became mind-numbing, and I simply marched, putting one foot in front of the other and watching for kilometer markers. It would be 13 miles before I could stop for lunch, and another 10 before I reached my day’s goal: Bratislava. But there’s a funny thing about long walks. With patience, all those steps add up, and by 2 p.m., I’d crossed a bridge over the Danube and settled into a cafe in the stately town of Hainburg, where an open-faced baguette pizza and glass of beer gave me the courage to face the miles ahead. And soon I found myself trudging along the shoulder of the small highway with cars flying past — and missing the monotonous near-silence of the forest. Not far off, I could see Bratislava’s hilltop castle — in Mr. Leigh Fermor’s era, a burned-out wreck worked by prostitutes but in the 1950s rebuilt as a stately white-and-red palace — and it teased me with its apparent nearness. Still, I had far to go, past a derelict border post, and through three miles of snaking bike paths, before I crossed the Danube again and was in the heart of Bratislava’s old town, all cobblestones and tile roofs and sidewalk cafes. After checking into the Hotel Kyjev — a 1970s tower turned budget boutique — I checked myself out: I wasn’t sore, out of breath or even tired. I did have blisters on my feet, but they were easily treated: puncture, drain, clean, bandage. My ankles, however, were terribly swollen, the peroneal tendons in particular, a result (I think) of how my body mechanics had altered with the weight on my back. I popped some ibuprofren, took a shower, then hobbled outside for dinner. It was the Friday during Passover, and like any wandering Jew, I wanted a Sabbath meal. And thanks to Chabad, the Hasidic Jewish outreach organization, I got one, at the home of the transplanted American rabbi Baruch Myers. He was only too willing to share his food (cucumber salad, gefilte fish), his friendship and his family, including a battalion of adorable children who cheerily walked me through the Passover story. It wasn’t just this heartfelt welcome that got to me; it was the very existence of a Jewish community in Bratislava. Back in his day, Mr. Leigh Fermor wrote, the Jews “were numerous enough to give a pronounced character to the town.” No longer. The Holocaust had reduced the Jewish population to, in Rabbi Myers’s estimate, 1,000 people. There was a synagogue, a few kosher restaurants, a Jewish museum and even a pension, but few visitors today would see in Bratislava a Jewish-inflected city. This entry was posted in A Time of Gifts, Between the Woods and the Water, In Paddy's Footsteps, Paddy in the News and tagged A Time of Gifts, Between the Woods and the Water, Budapest, Vienna on June 13, 2010 by proverbs6to10.